Covecastles is a Caribbean beach getaway with villa accommodations and attentive service. The resort's sandy beach makes you wish you could transport there instantaneously by just looking at the photo. Located on the Caribbean island of Anguilla, the hotel offers a variety of activities, including kayaking, bicycling, tennis and fitness. 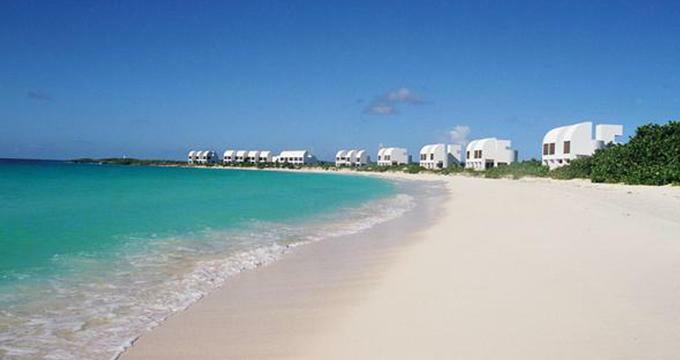 Anguilla is famous for its luxurious lifestyle and relaxing atmosphere. The island is favored by families as well as couples on their romantic getaway because of the pristine sandy beaches. Guests enjoy plenty of privacy and seclusion. Villas and beach houses have kitchens where you have the option of preparing your own meals which can be especially handy when traveling with children. Choose from a variety of villas, beach houses and the Pavilion, each offering a unique layout and quick access to the beach. Villas: These 3-bedroom homes set right on the beach have a split-level living room, kitchen, and a private terrace just steps from the beach. Turn on air conditioning or open the windows to let it fresh sea air. Grand Villa 6: Grand Villa 6 offers 5,000 square feet of living space with incredible ocean views and accommodations for 8 guests. Have fun next to the pool and head to the beach for snorkeling and swimming. Grand Villa 5: This five-bedroom home measures 6,000 square feet and accommodates up to ten guests. Beach Houses: Enjoy a two-story layout with a living room, kitchen and terrace. The Point at Covecastles: Measuring 9,000 square feet, the Point has a beautiful Grand Master Bedroom with twin decks, and oversized Jacuzzi Bathroom. The Pavilion: This unit is set on its own private cove for extra privacy and has a Grand Master Bedroom and 2 to 3 guest bedrooms, each with private bath. Facilities include a spacious lounge area, 42-inch TVs, Olympic Lap Swimming Pool, six-person Hot Tub and a separate pool for toddlers. This ultra-luxury house has tennis courts lit for night play. Enjoy romantic sunset walks along the hotel beach, have a tropical drink with your feet in the sand and try a variety of watersports. Complimentary activities range from paddle boarding and sailing to bikes and access to the fitness center. The staff can arrange a variety of other activities for a fee, from scuba diving and a dolphin swim to a fishing boat. Each villa has a fully equipped kitchen with dining rooms and al fresco dining, perfect for relaxing in privacy. Have a personal chef prepare your meals or get delivery from top restaurants on the island. In addition, the Clubhouse serves breakfast, lunch, and cocktails. If you have special wine or other requests for your stay, let the concierge know before you arrive. Whether you want to elope or host a large wedding, the resort can accommodate up to 90 guests. Get married on the pristine Caribbean beach. Weddings start at $2,500 and include the essentials such as license fees, cake, romantic dinner and other details.